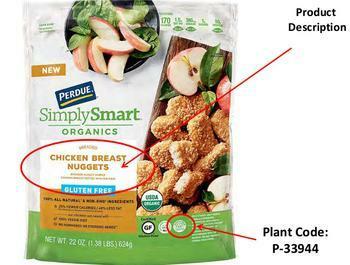 Perdue Foods of Perry, Ga., is recalling approximately 68,244 pounds of ready-to-eat chicken nuggets. The product may be contaminated with extraneous materials -- specifically pieces of wood. The recalled product, bearing establishment number “P-33944” inside the USDA mark of inspection, was shipped to retail locations nationwide. Consumers with questions about the recall may contact Perdue consumer care at (877) 727-3447.